Tancred was a tall and physically imposing black man, but he was also approachable. He could not sit anywhere for long without someone starting a conversation. This was, his friends liked to say, because his blue eyes were startling and his voice deep and avuncular. So, when he wanted to be alone without necessarily being alone, Tancred answered in French – his maternal tongue – when spoken to by strangers. Few who came into the Dolphin knew the language. But Willow Azarian did, and she took the fact that Tancred spoke it as a portent. They would be friends. She knew it and, touching his arm, she blithely began to tell him about her family.Reading the past two books by André Alexis (Pastoral and Fifteen Dogs), it was obvious that the author has been experimenting with old-fashioned forms of storytelling. But it wasn't until I finished The Hidden Keys and started to read the newspaper reviews of it that I finally learned that Alexis is presently in the middle of a larger, linked project – which he refers to as a “quincunx” – and this project is so central to the understanding of any one of the books that I'm going to put his own explanation of it here, as written in Quill and Quire :For years, I tried unsuccessfully to rewrite (or re-imagine) a work by Pier Paolo Pasolini called Teorema. In Teorema, a god comes to earth and interacts with the members of a well-to-do family. This interaction leads to madness, despair, grace, and the miraculous. It’s a truly great story and I wanted to retell it, to own it as one does with some stories. I couldn’t, though. I ended up writing inept versions of Pasolini.Or I did until I finally stripped the story down to its essence – divine visitation – and thought about the ways in which that essential story could be told. Five approaches came to me at once. I wanted to tell it as a pastoral (that is, a tale set in an idealized rural world), as an apologue (a moral tale involving animals), as a quest narrative (with Treasure Island in mind), as a ghost story (like Ugetsu Monogatari), and as a kind of Harlequin romance. The novels were suggested not by personal experience, not by grief or exile or post-traumatic stress, but by the art of storytelling itself.The Hidden Keys, therefore, is the third volume of the quincunx – the quest narrative à la Treasure Island – and is meant to revisit the same themes as the two previous volumes. Huh. Here's what happens: Willow Azarian – a middle-aged super-rich heroin addict – approaches professional thief Tancred Palmieri in a seedy Toronto bar, and after convincing him that she is, indeed, one of the heirs to a billionaire's fortune, Willow begins to talk of a hidden treasure. Apparently, upon her father's death, each of his children had been given a unique memento – a painting, a poem, a Japanese screen, an architectural model, a bottle of aquavit – but only Willow believes them to be clues for a treasure hunt. As her siblings refuse to allow her to examine their objects on her own, Willow enlists Tancred to “borrow” them for her.The Hidden Keys reads like a crime caper as Tancred attempts to burglarise fortress-like homes; like a puzzle book as the objects are examined for hidden meanings; like a detective novel as one of Tancred's closest friends is a police officer investigating the thefts; like a morality tale as various seedy characters' behaviours can be traced back to their upbringing; and as a character study of the city of Toronto. It's not a rip-roaring adventure tale like Treasure Island, but in the endnotes Alexis acknowledges that a dozen other obscure works are also alluded to in this book. And what to make of it all?On its own, The Hidden Keys has many nice moments of character and dialogue, with interesting philosophical and sociological musings. But I felt a bit let down plot-wise: the puzzle of the five objects wasn't very difficult, yet wasn't presented to the reader in a way that would have allowed me to make guesses ahead of the characters (and isn't that the point of a good mystery?) At this point, I can't really see how these first three volumes in the quincunx relate to each other (besides a surprise appearance by some characters from Fifteen Dogs to be seen here), and by itself, I don't know if The Hidden Keys is all that interesting or important. Yet, now that I know this is all one big project, I'm even more intrigued about what Alexis has coming up next. I read this aloud on two road trips, hence the long hiatus. It turned out to suit that purpose very well. It's a very visual book; Alexis' descriptions bring to life the worlds of the very rich and very poor in Toronto, each world with its own type of hustler. It's a treasure hunt/mystery story that addresses some of the same themes as Alexis' previous novel, Fifteen Dogs--love, fidelity, family, honour. (In fact, there is a very quick and unexpected reference to Fifteen Dogs in the middle of The Hidden Keys.) I liked the main character, Tancred the gentleman thief, very much; he is an unrepentant thief but when he makes a promise to help a woman who seems to be a poor heroin addict, he keeps his promise despite the fact that it brings him much deeper into a strange world than he intends to go. Like Tancred, Alexis has a deft, elegant touch, and I am looking forward to his next book. Andre Alexis is quickly becoming on of my favourite authors. I loved the creativity and beautiful writing in "Fifteen Dogs" and "The Hidden Keys" did not disappoint. It was a thrilling, can't put it down treasure hunt. Every character --especially the thief was a strong moral compass Tancred -- was unique, interesting, and multilayered. Toronto (slightly fictionalized, but also very real) played an important role, which was a really nice bonus for Torontonians (like myself). I also loved his subtle recall of "Fifteen Dogs" with the brief return of Nina and her "dog" Majoun. It is a fun read, but it also has a lot of depth on themes such as relationships, rich vs. poor, what is the home, money, good vs. evil, etc. A highly recommended read. After I read “Fifteen Dogs” several years ago Andre Alexis became on author on my “need to read more by him” list. If you saw my TBR you would understand why that hasn’t happened until now. When I read about the release of this book in 2016 I knew I wanted to pick it up. It took me this long to get to it. Shame on me!THE HIDDEN KEYS by Andre AlexisTancred Palmieri is an enigma – an honourable thief who also happens to have a detective as a best friend. He lives in and mixes with the people in a shadier area of Toronto, not somewhere you would expect to meet Willow Azarian, a billion dollar heiress with a not so secret heroin addiction. Tancred knew nothing about Willow but she knew him by reputation. A chance(?) meeting sitting on the barstools in a dive bar prompts them to start a conversation. Tancred took Willow to be what she appeared, a slightly eccentric addict with possibly delusions of grandeur – until she shows him her “mad money” bank book containing a 6 figure balance. After saving her from some thugs Willow tells Tancred a fantastic story about a treasure hunt her father arranged for her before he died. Each of the five Azarian siblings received an unusual gift bequest in their father’s will. Each gift individually was simply a memento but combined they were an intricate series of clues. Willow is convinced there is a pot of gold at the end of the hunt but her siblings believe otherwise. Willow wants Tancred to steal each of their mementos and help her solve the puzzle. He gives his word and Tancred is nothing if not a man of his word even when it means completing the task without Willow’s help. He quickly finds out that others are also on the same quest but is he on the mother of all treasure hunts or the wildest goose chase of his life?As he did in “Fifteen Dogs” Mr. Alexis gives his reader an extremely entertaining story. This one is filled with eccentric characters from all parts of the economic spectrum, he gives us moments of almost slapstick humour and at other times nail biting suspense, all combining to ask the reader to question what the true meaning of family, friendship and promises might be. Amazingly enough he does this in an unobtrusive way. Never obviously preaching the subtle undertones, it wasn’t until I read the last page and closed the cover that it occurred to me how meaningful this entertaining story really was. If I was pressed to find fault with the book I would have to admit that in one or two instances it dragged a little, more than likely because I was impatient to find out if there was a treasure. It was fun to read a book set in Toronto, a city I know well so it’s still five stars for this one. Mr. Alexis hit another one out of the park. Andre Alexis is in the unenviable position of having to follow up a book that won a billion awards, and unfortunately, that can lead to inevitable comparisons between books, even when they have nothing to do with each other. In this case, I found myself frequently going, "I mean, it's good and all, but it's no Fifteen Dogs." That's unfortunate, really, because The Hidden Keys has plenty of charms of its own and it would be difficult to recapture the lightning in a bottle of "that dog book", so really I shouldn't expect him to. I definitely enjoyed a lot of things about this book, particularly its sort of whimsical tone and the intrigue associated with the Azarian puzzle, but it didn't really stand out to me so much. Maybe it was the lack of attachment I felt to the characters, but I just didn't feel any pull to keep reading it. The fact that it took me a week to read a 225 page book with a very compelling premise is really surprising to me, given how invested in the puzzle I was when I first started reading. Sadly, that investment didn't really last, and I felt a bit let down by the ending (view spoiler)[ - Tancred just suddenly piecing it all together without the audience getting let in on anything, but rather the narrator just explaining it all was a bit of a disappointing place for a "tell rather than show" moment. And Tancred's final chapter felt a bit tacked on and weak. I would have preferred something that didn't feel so rushed (hide spoiler)]. Anyway, certainly worth a read, but I'd recommend Fifteen Dogs as the greater example of what Alexis is really capable of. I haven't read any of André Alexis's other books – apparently they all link together thematically, so perhaps if I'd read the others I'd get more out of it. As a standalone it was fine, but didn't feel like anything special to me. The narrative style isn't to my taste and I found the characters unrealistic and irritating. I don't think this is a badly-written book, but it didn't click with me. This delightful book deserves a more knowledgeable reader than I, not being fond of puzzles.Still, there was much to enjoy, and I daresay that its far more interesting than the doggy one, and almost as fun as the one with the sheep. Simultaneously a fun heist story, philosophical examination of good and evil, and meditation on agency and fate. Favourite quote from this book: "I believe we do good or evil indiscriminately because we haven't a vantage from which to judge our actions before we've committed to them." This is the third book I've read by André Alexis, and I continue to love the thoughtfulness in and elegance of his writing. As a Torontonian, I especially delighted in his use of Toronto as the main setting. He's imagined an intricate puzzle adventure with a creative cast of characters. The only 'critique' is that the story could've benefited at times from a lighter narrative tone to offset the seriousness of the messaging and to keep a more whimsical feel to the adventure story. Alexis already had all of the appropriate pieces in place - characters and situations; he just never quite fully capitalized on them. I was really excited to read this. A puzzle book, a mystery with exciting sounding characters, sounds perfect right? It has good reviews too! I was bored though, almost didn't bother to keep going bored. Tancred, the main character was likeable enough I guess. But I wasn't emotionally invested in any of the characters and I thought the puzzle was a disappointment. I don't know what to say, just mehh? Great ideas here - a Toronto thief/detective must track down five different pieces of art as clues for a hidden treasure. I picked this up because it was recommended at Powell's Bookstore in Portland. I didn't love it, however. The "clues" weren't as much fun as they should have been and the ending was flat. Too much had to be explained by the narrative and I didn't believe the resolution. Not a success as mystery fiction. This was a good mystery/puzzle book that starts with a middle age heroine addict hiring a young thief to steal and return items to help her prove that her father did leave a treasure hunt for her and her siblings. While I enjoyed the story what really kept me invested and enjoying the book were the very entertaining and unique characters. Serendipity is a wonderful thing. When you have had the marvellous good fortune to read great books such as Maria in the Moon and All The Wicked Girls, it’s hard to know what to read next. In these circumstances, it’s always going to be the next to read on my TBR pile.The Hidden Keys was that book and it is just what was needed. Refreshingly different, quite quirky, it is a peculiar and charming mixture of contemporary fiction with almost Dickensian characters. At heart, it is a treasure hunt, with an abundance of clues, each one contained in an object bequeathed to his children by the immensely wealthy Robert Azarian.Tancred Palmieri is a thief and our protagonist. A thief who these days largely steals to order. He never steals in his own 14th district of Toronto, because that is where his great friend Daniel Mandelshtam is a detective with the police force. An imposing figure, he is a 28 year old black man who has his own set of moral principles and would like to think that he is largely an honourable man.When, by chance, he meets Willow Azarian, a heroin addict, in a bar in a less than salubrious part of town, she talks about her great wealth. Tancred likes her and is a little intrigued. Thinking no more about her though, he continues on his own path until one night he rescues Willow from being attacked by some thugs. She is moved by his kindness and tells him she will never forget him.Some time passes, during which Tancred’s mother dies of cancer. Her dying wish was that he change his life and she had tried to elicit both Daniel’s help and that of their other great mutual friend, Olivier to ensure he did so.Though his grief affects him greatly, Tancred has not changed his ways, but even so the thefts feel emptier now than once they did.Three years after their first meeting, Willow seeks him out once more to ask him to carry out a task for her. She tells him of the unique items left to her and her siblings. Respectively, a painting, a poem, a Japanese screen, an architectural model of a Frank Lloyd Wright house and a bottle of Aquavit.Willow believes these are clues to a missing fortune and because her brothers and sisters refuse to indulge her fanciful theories – believing them to be, at least in part, drug fuelled, Willow asks Tancred to ‘obtain’ these items for her so that together they can follow the clues.However life is never quite as straightforward and into this mix two not so loveable rogues are interjected. A black albino named Colby is Willow’s dealer and he has a sidekick with a brutal streak called Sigismund Luxemburg, known universally as Freud. When Willow dies, these two have also heard her stories of hidden treasures and they are quite clear that they have rights in acquiring such riches.How Tancred navigates these pitfalls, and how, with the help of an amusing and rather splendidly bizarre character, Alexander von Wurfel, who is a taxidermist to the rich, they find their way towards solving the treasure hunt is a beautifully told tale.With moments of cold brutality, this is nevertheless a gentle and thoughtful book. Peppered with humour, intricately written, it is quietly full of philosophical moments questioning the nature of good and evil and what it means to be honourable.Quite different, full of beautifully observed characters and ultimately quite moving, this original story will stay with me for some time to come.I thought the end was a bit rushed and slightly flat, but overall a delightful read. 4.2 starsI think it is such a neat idea that this book is part of a "quincunx," the third book of closely linked books. Is this similar to the "uberbook" that David Mitchell is writing with his individual books? In any case, Majnoun and her owner from Fifteen Dogs does appear here briefly in Hidden Keys.Andre Alexis did a really good job of conjuring up the streets of Toronto in Fifteen Dogs and he does an even better job here. He goes into what makes Toronto home to so many - some of the multicultural stores and restaurants, the streetcars, the myriad people even the often cursed traffic. Familiar names of Parkdale, Rosedale, Point Pleasant Cemetary are brought up and it's a real pleasure to have been there and admire the rendering of the place on paper. The end of the treasure hunt and the point of it brings some poignancy and thoughtfulness. The process of the treasure hunt itself reminded me of Angels and Demons, not something I could have solved myself but interesting to learn some art and music details. E.g. I didn't know/remember that Glenn Gould was Canadian. Or that his famous piece The Well-Tempered Clavier had a number it was known by. Andre Alexis thoughtful points on the predilection and behavior of the rich are interesting. It led me to a thought experiment too of how to react if someone were to leave me an inheritance of a few hundred million dollars, expected vs unexpected. Tancred is an interesting character who is difficult to pin down. Yes, he steals professionally but he also keeps his word to a dead heroin addict despite financial temptations. Also of interest is how Willow's family referred to her: "I love her but she was a heroin addict." How did she come to be defined and ultimately destroyed by that? By all accounts, she was very intelligent and well-loved. Not to mention rich.Andre Alexis' work from reading this book, Fifteen Dogs and A is a good blend of philosophy and some quirky action. Often thoughtful, it doesn't rush into judgement and leaves us room to think and ponder for ourselves. There is usually something however that prevents me from unabashedly loving his works and I can't quite pinpoint it. But I will definitely watch out for the other books coming out of this set. Willow is an ageing heroin addict, the daughter of an extremely wealthy man who has recently died, leaving each of his five children very well off. However, each child is also left a mysterious object which Willow believes is a clue to an even greater fortune. Obviously to solve the puzzle, all five objects must be examined but the other family members are unwilling to part with their gifts. Willow therefore resorts to less conventional methods and recruits Tancred, a sophisticated but strangely ethical thief, to help her “borrow” the other four objects. It soon transpires that Willow is not the only person who has embarked on this “treasure hunt” and things begin to get complicated. Very unusually for me I finished this book in 3 days (I am a very slow reader so this is very fast). It is short, but it is also unputdownable – if that isn’t a word already, then it should become one. I loved this book. It is a puzzle book, although the readers don’t have to solve the puzzle themselves. A great book, one that I would have loved to have written if I had the ability, the creativity and the imagination. Sadly I don’t have any of the above, which is why there are authors like Andre Alexis to do it for me. I think the only other book that I have felt this way about was Cloud Atlas by David Mitchell which also has cryptic and complex enigmas as an integral part of the story.Populated by eccentrics and oddballs, this book introduces a wonderfully eclectic mix of characters. The author creates a world of unconventionality, both in terms of the inhabitants of the world and the quest upon which they embark within it. It is a delicious and utterly captivating combination.I don’t think I can find a single negative comment to make about this book – very rare for me so it must be good! !Although I have never read any books by this author before I will certainly be looking out for others, especially if they are written in a similar vein. Good job Andre. I loved this book. I had not loved Alexis' 15 dogs as my tender dog-loving heart found it too painful to read: there were so many bad ends for our doggie protagonists. But this book I could whole-heartedly embrace. Alexis has an seemingly easy flowing writing style and he develops character quickly and deftly. I also enjoyed the complex plotting of the treasure hunt and how more and more people are sucked into the mystery. At the heart of the novel is an exploration of character: why some people are weak and others strong; why we love; what is honour and faithfulness; and how does one be good? Or are there even absolute answers to these questions? Our unlikely hero is Tancred, a more than competent thief who befriends an aging junkie only to find out that she is a rich man's daughter who has a quest for him to fulfil. Among the characters who are dragged into this quest are his Tancred's childhood friends Ollie and Daniel.Adding to my enjoyment of the book is the portrait of Toronto, explored here from the heights of the Hidden Castle to the seamier parts of town. I'll start by saying I thought the idea behind the story was good. However, I didn't like the author's writing style at all. Way too wordy. This isn't a book you could just sit and read all in one sitting. I found I had to lug through it and could only read 20-ish pages at a time.At first, I thought it was cool that a book was set in Toronto. However, I soon thought the author was trying too hard to name drop every street, shop, restaurant, etc. downtown. I wonder how someone would feel if they tried to read this and didn't know the area... it basically felt like the author had a quota to mention Toronto streets or landmarks and was paid by the word.After the first 1/3 of the book, when the story starts to unfold and they go on the treasure hunt, I started to get into it a tiny bit more. However, I was waiting for something really big to happen at the end. The ending is a bit of a disappointment, to be honest. I’m not enjoying this book. Most of the characters especially von Würfel are introduced without any real motivation to take the same path Tancred takes. It just doesn’t seem natural. After finding the detective to be Tancred’s friend, I no longer accepted tie-ins. That took it all from me. 😒And whilst I see this isn’t the author’s first book, it feels like it. I’m usually reading two books at once and I’m never eager to pick this one up. It’s quite painful. Here is an example of random thoughts that don’t connect: p77. “I’ve been thinking about him...good or evil. How could his wife’s pregnancy make him think of a lowlife buddy being a dad. It’s just not a line of thought any normal person would take. And then to put Ollie against Tancred and he doesn’t stack up to a thief just cause he has uneducated & works in service and just exists?? I usually don’t take 3 weeks to read a book, but I can see already I will have to max out the renewals. A strange but captivating story. Set in Toronto, it was both familiar and strange. Familiar because of the neighbourhoods I know so well but unfamiliar because of the people who inhabit them! This book won the Giller Prize, a Canadian Literary Award of some importance. The hero is Tancred, a thief, but a thief with honour and scruples. He makes a promise to a dying woman and is thrown into a scavenger hunt to steal five keepsakes given to her and her four siblings,by her father on his death. Willow, a dying junkie is convinced it is a puzzle that will lead to more riches. That's just the beginning. Many intriguing characters bring this story to life and I think it has a good ending but I'm not sure!!!! I didn't quite understand all the philosophical undertones of the complex telling of the story but it was a great read. A very interesting and unusual book by the author of “Fifteen Dogs”, which I loved. I enjoyed Andre Alexis’ writing style but I’m not too sure what to make of the book. What is the purpose of the puzzle? What is the meaning of the quest and how Tancred dealt with his “inheritance”. It definitely made me think about values, consider questions - what is honourable, can a thief be honourable? Is he any less honourable than the wealthy man who undercut the thief’s share of the inheritance? Regardless, the book is a good read and I enjoyed it, especially the characterization of Tancred and friends, the description of how they became what they became and how Tancred came to his decisions. It is hard to find the words to express how much I love reading André Alexis. His storytelling skills are fantastic. The writing is always beautifully done and the characters usually a motley crew that the reader ends up loving.No exception here. 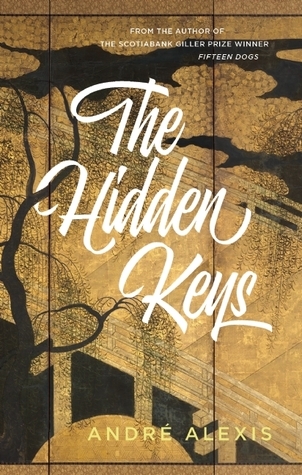 The Hidden Keys is the authors take on a Treasure Island style story. Buried treasure in Toronto? Count me in. Once again the characters are a strange pack of interesting folk that all somehow fit well together.This is #4 in the Quincunx following the publication of #1 and #2. The stories do not need to be read in any kind of order so the numbering interesting to me. Sometimes characters from the other books show up again briefly, that is the only tie in.Even given this information I recommend reading them in the order of publication. This book is ostensibly about the puzzle of the objects given Willow Azarian and her siblings, but as Tancred Palmieri works through the puzzle, there are other puzzles, of how to deal with various characters, criminals, eccentrics, his friend the police officer, etc. And the more he learns, the more he (and the reader) question the premise of the puzzle (did it not exist, was it about family and not money). I wish I knew Toronto better, because it is also a major feature of the book and it would help to know what different neighborhoods suggest. I also am curious about the rest of the books in the quincunx (?) Alexis is writing. I rather enjoyed this strange book, in spite of some unpleasant characters and a treasure hunt with 'red herring' clues.Our hero is a young professional thief who promises a rich ageing heroin addict before she dies that he'll steal & solve the clues to her father's secret treasure. This involves some clever ways to cheat his way into the lives & properties of her siblings to obtain the clue objects, using good friends to aid his thefts. Their are a couple of horrid, violent 'baddies' after the same things of course. In the end the mystery is solved, but it doesn't seem to bring anyone happiness, only questions about honour & loyalty.Thanks to Serpent's Tail for my free proof copy. An interesting story set mainly in Toronto. Tancred, a young black man growing up in a less celubrious part of town is befriended by a much older white woman who is a drug addict. Upon discovering that this woman is rich and that she and her four siblings were all left a unique artifact from their father, he helps the woman embark on a treasure hunt to try and discover what clues they are hiding. Interesting characters and a different kind of plot make this an easy to read novel that will keep your interest throughout. The ending was a little disappointing for me as all the loose ends were not sufficiently tied to my satisfaction. This is an Evergreen Nominee (Ontario Library Association Forest of Reading Program) for this year & one of my favourites, if not my favourite. I would describe it as a quirky mystery. It is set in the Toronto area, not far from where I live, & the main character, is Tancred, an honourable thief. He becomes friends of sorts with an elderly drug addict who claims to be wealthy & wants his help in stealing objects from her siblings, objects they have inherited & that she believes will help her to figure out a family mystery. The other main characters are Tancred's childhood friends who have grown up to be a policeman & fellow thieves. What I enjoyed most about this novel was that it seemed as though I were reading an actual encounter between well manifested characters in a surreal instance. Everything about this novel seemed natural, down to the last detail of the street corners they resided upon. I happened upon this novel in the library, and as I didn't have enough time to peruse the shelves and find one suited to my familiarity, I quickly read the synopsis and decided to give this novel a shot. I'm very glad I did. I definitely recommend this novel.